Two weeks before the Cannes Lions Festival of Creativity getting a cheap apartment 1 minute from the Palais seems too good to be true. And it is. 2 weeks after winning The Young Glory Award in competition with 100 teams from all around the world, danish ad students Alexander Keblow Kofoed and Christian Skjoett from Creative Communications at The Danish School of Media & Journalism are at it again. 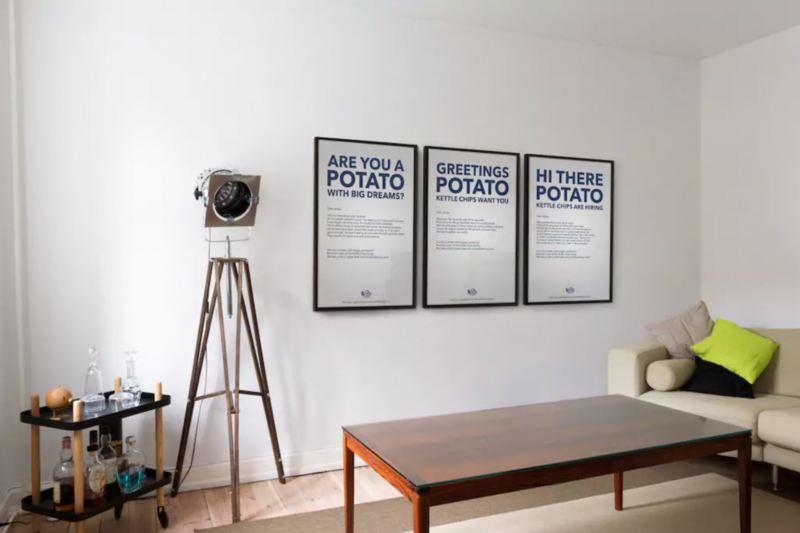 In search of attention from international creative directors they are offering an apartment on airbnb that is too good to be true. And it actually is. The whole thing is a stunt. Of course these guys are not making that much money, that they can afford this. This is a airbnb hack. The apartment cannot be rented. (In fact the interior photos are from an apartment belonging to a friend of Alex in Copenhagen, dressed up to show pieces from their portfolio and the adress is taken off googlemaps from across the Palais. But hopefully creative directors will be intrigued by their creative firepower, that they will let the guys buy them a cup of coffee or a beer on The Croisette during the Festival? With the appartment for rent on airbnb from today, no creative directors have been in contact yet. But with two weeks to go until Cannes Lions, the guys are optimistic.